East Meets West Music is the official recording label of The Ravi Shankar Foundation. With unique access to an archive featuring thousands of hours of live performance audio, film footage, interviews, and studio masters, EMWMusic releases rare recordings and provides audiences with the definitive portrait of Ravi Shankar’s long career. And, in keeping with Ravi’s dedication to looking forward and not back, EMWMusic provides a vibrant platform for new artists, projects, and collaborations. Legendary virtuoso sitarist, composer, writer, and teacher—Ravi Shankar was India’s most esteemed musical ambassador and a singular phenomenon whose artistry crossed all cultural and musical boundaries, renowned throughout the world for his pioneering work in bringing Indian music to the West. The youngest son of a Bengali family, Shankar was born in 1920 in Varansi (Benares) India and spent his youth touring India and Europe with the dance group of his brother Uday Shankar. After years of splitting his time between dance and music he dedicated himself solely to the sitar in 1938, returning to India and studying for seven years under his guru, “Baba” Allaudin Khan. After finishing his studies in 1944, Shankar worked as a composer in Bombay and Delhi, creating the music for Satyajit Ray’s Apu Trilogy films, working as the director of All-India Radio, establishing the National Chamber Orchestra (Vadya Vrinda), and innovated Indian musical traditions by incorporating folk melodies into his concert performances. In 1956, as word of his virtuosity spread throughout India, then Europe, Asia and the United States, Shankar began touring and embarked on one of the most extraordinary careers in the history of contemporary music. The late 1950s and 1960s proved extraordinarily productive for Shankar, as he toured the West, produced a plethora of albums, composed for both Indian and Western orchestras, established several schools of music, served as guest lecturer at both UCLA and CCNY, performed at both Monterey Pop and Woodstock music festivals, and won a Grammy with Yehudi Menuhin for the groundbreaking West Meets East album. By the 1970s, Shankar’s activities engaged the world in Indian musical cultural traditions and introduced Western techniques and instruments to Classical Indian forms on such a scale, they earned him the title ‘Ambassador of World Music.’ In 1970, Shankar ushered in a major period of East-West collaboration with his first of three concertos for Sitar and Orchestra, commissioned by the London Symphony Orchestra and premiered under Andre Previn. Furthering his dedication to ‘Peace Through Music’, Shankar’s collaborations (and friendships) with virtuoso violinist Yehudi Menuhin, the Beatles’ guitarist George Harrison, and minimalist composer Philip Glass (among others), established him as an advocate of music as a means of social change, most known through the benefit concerts for Bangladesh organized in 1971 by he and George Harrison. The 1980s and 1990s were no less a time of creativity. Both his second Concerto for Sitar and Orchestra (with the New York Philharmonic, conducted by Zubin Mehta) and his dance drama, Ghanashyam, premiered in 1980. He wrote the Academy Award-nominated score to Sir Richard Attenborough’s 1982 film Gandhi. In 1986, he served a member of the Rajya Sabha, India’s Upper House of Parliament. Just prior to Berlin Wall coming down, Shankar performed in 1988 with an international ensemble inside the Kremlin. In 1990 he released a highly popular collaboration album with Philip Glass, Passages. Beyond his public appearances and composing, he wrote his 352-page autobiography, Raga Mala, published in 1997. He also began to train his daughter, Anoushka Shankar, on the Sitar in the late 1980s, which culminated in her public debut in performance with her father at the age of thirteen for his 75th birthday in 1985. Throughout they 1990s they toured together extensively. 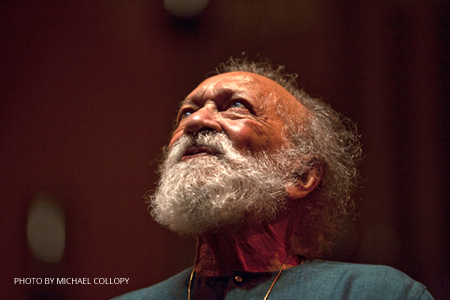 In the 2000s, Shankar remained active in his teaching of the Indian Classical Gurukal System by founding the Ravi Shankar Centre (aka the Research Institute for Music and the Performing Arts) in Delhi in 2000 with the support of the Ford Foundation and its sister organization, the Ravi Shankar Foundation, in the United States. Shankar also premiered a number of Western classical-influenced works including: contributing music for Orion that opened the Cultural Olympiad in Greece (2004); his third Sitar Concerto, commissioned by the Orpheus Chamber Orchestra with Anoushka on Sitar (2009); the Sitar and Violin piece Variant Moods for Joshua Bell and Anoushka (2009); Symphony for the London Philharmonic Orchestra (2010). In 2010, Shankar, indefatigable even at 90-years old, founded his own independent label, East Meets West Music, as a way to bring to audiences the rare and unreleased recordings held in his archive and hand picked by Shankar himself between 2009 and 2012. East Meets West Music also released his final recordings, The Living Room Sessions, the first installment of which won the Grammy award for Best World Music Album. Awards: Ravi Shankar was a five time Grammy Award Winner: Best Chamber Music Performance for West Meets East (with Yehudi Menuhin) in 1967; Album of the Year for The Concert for Bangladesh (with George Harrison) in 1973; Best World Music Album for Full Circle: Carnegie Hall 2000 in 2002; Best World Music Album for The Living Room Sessions Pt. 1 in 2013; the Lifetime Achievement Award in 2014. He was an honorary member of the American Academy of the Arts and Letters, recipient of seventeen honorary doctorates and was appointed a Regents Professor at the University of California. He was also the recipient of the following international honors: Praemium Imperiale Arts Award (Japan); Fukuoka Asian Culture Prize; Polar Music Prize (Sweden); Bharat Ratna / Jewel of India (India); Commandeur de la Legion d’Honneur (France); Honorary Knight Commander of the Most Excellent Order of the British Empire (UK); Tagore Award (India). Recordings: Ravi Shankar’s extensive discography spans more than 60 albums…and probably twice that number in bootlegs.